Includes 8 500ml cleaning bags, 1 black, 2 cyan, 2 magenta, and 2 yellow 500 ml ink. 7 cleaning bags used prior to inserting inks, then 1 black, 2 cyan, 2 magenta, 1 yellow and 1 cleaning bag. 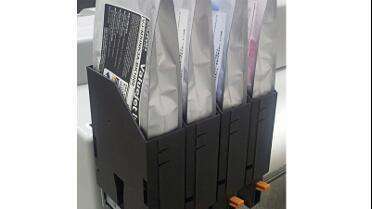 Includes 9 500ml cleaning bags, 1 black, 1 cyan, 1 magenta, 1 yellow 500 ml ink, and 1 white 500 ml ink. 7 cleaning bags used prior to inserting inks, then 1 black, 2 cyan, 2 magenta, 1 yellow and 2 cleaning bags.